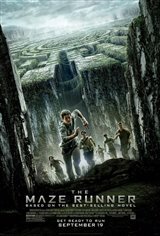 Teenager Thomas (Dylan O'Brien) is brought to a place called the Glade, a giant maze surrounded by vicious creatures called Grievers. He has no memories of anything in his life that happened before. The Glade is inhabited by other teenage boys, all of whom have specific jobs to do. Over time, Thomas finds out that the boys have been trying to solve the Maze for two years and that a sting from the Grievers can cause you to recall memories from the past. Each month, a new boy arrives, but soon after a girl arrives with a message saying she's the last one, she winds up in a coma. However, Thomas realizes he can hear her speaking in his head and when she wakes up, they form a bond. Along with the other boys, they try to figure out a way to escape. Based on the young adult novel of the same name by James Dashner.